Hydraulic power pack design must determine the components of several parts, first part of dynamic components, dynamic components are the motor of the machine through the hydraulic fluid into pressure energy, through the pre-installed in the motor output of the hydraulic pump power source to the pressure large, medium and small to sub-select gear pumps, vane pumps and piston pumps, hydraulic cylinders and hydraulic motors, power components, control components, auxiliary components. 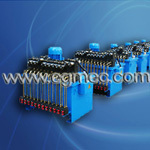 The following are Egmec hydraulic power pack design hydraulic system design program: according to customer requirements of the hydraulic system of planning and reasonable layout, the technology sector in the form of writing, the drafting of the hydraulic system diagram, according to the working environment, the implementation status of selected components, power components, control components, auxiliary components, hydraulic oil , a variety of basic circuit design, select the appropriate cylinder speed program, action transformation program to determine the pressure of the safety program and unloading requirements to ensure the normal operation and design work in order to complete the action. Configuration table lists the electrical components, the design cycle by action. Calculation parameters to determine the parameters of the selected components and is reasonable and scientific, computational theory and practice is consistent with, and then modify and confirm. In the hydraulic system is completed, to re-enter time checking and reasonable regulator, the final inspection and test run the system to achieve the best operating condition.